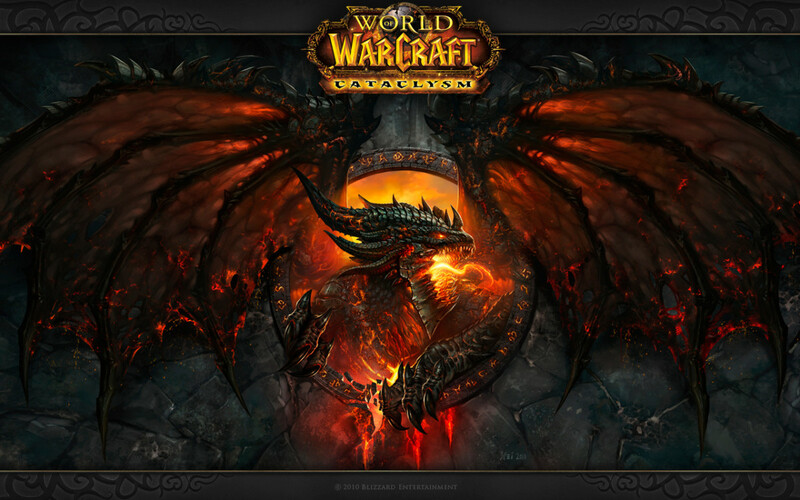 David is an avid video gamer across multiple platforms such as PC, consoles, handheld devices, and mobile phones. While not all of these skills are necessary, having as many as possible allows various types of trading to be done. Trade - This skill allows the active buy/sell limit on the market to be increased by 4 per level. This is a skill that must be picked up right away to trade on the market. Retail - This skills increases the active buy/sell limit on the market to be increased by 8 per level. Wholesale - This skills increases the active buy/sell limit on the market to be increased by 16 per level. Tycoon - This skills increases the active buy/sell limit on the market to be increased by 32 per level. This is the highest skill book for buy/sell order limits and is a must buy if the market plans to be a major money maker for the player. Margin Trading - A very valuable, yet dangerous, skill to have. 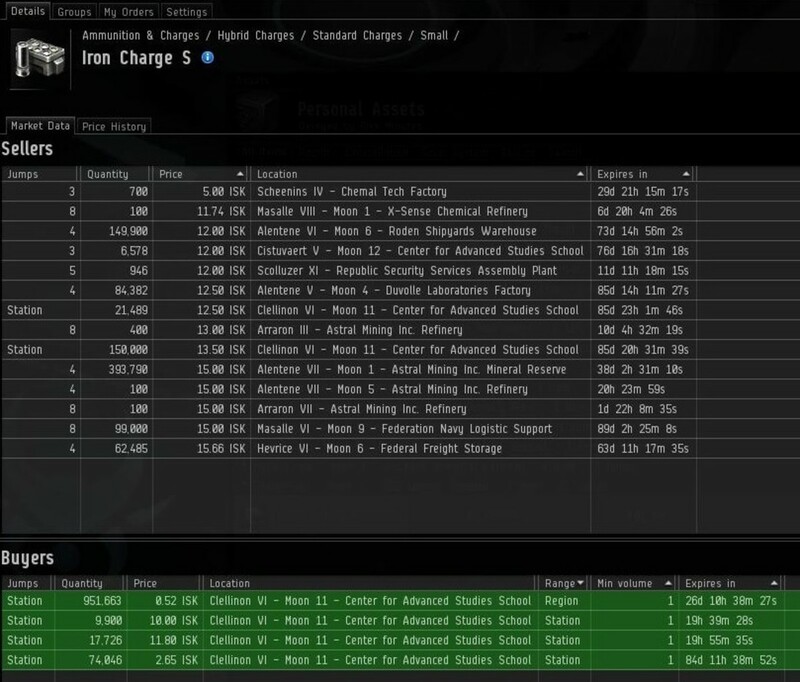 This allows a player to reduce the amount of ISK that must be put up when entering buy orders. At max level, a player will put up just 24% of the total value of the buy order. Top traders use this skill and use it well. Accounting - Just like real life, taxes have to be paid in EVE online. Each level reduces transaction tax by 10%. Will help save money in the long run, so it should be picked up when possible. Broker Relations - There is typically 1% fee or an order's value charged with an order is placed on the market. This skill drives that price down 5% per level. Another one that should be picked up in order to save on some ISK. Marketing - This skill allows for items to be sold remotely. So if goods are acquired in low-sec space, then they could be sold remotely to avoid the risk of going to pick up the items and possibly being pod-killed. The first level allows items to be sold within the same solar system, while the max level allows for the entire region. Daytrading - This is valuable if orders were placed all over a region and modifications need to be done to them. The first level allows them to be modified within the same solar system, while the max level allows for the entire region. Procurement - This skill allows for buy orders to be placed remotely. This can allow a player to set up buy orders no matter where they are located. 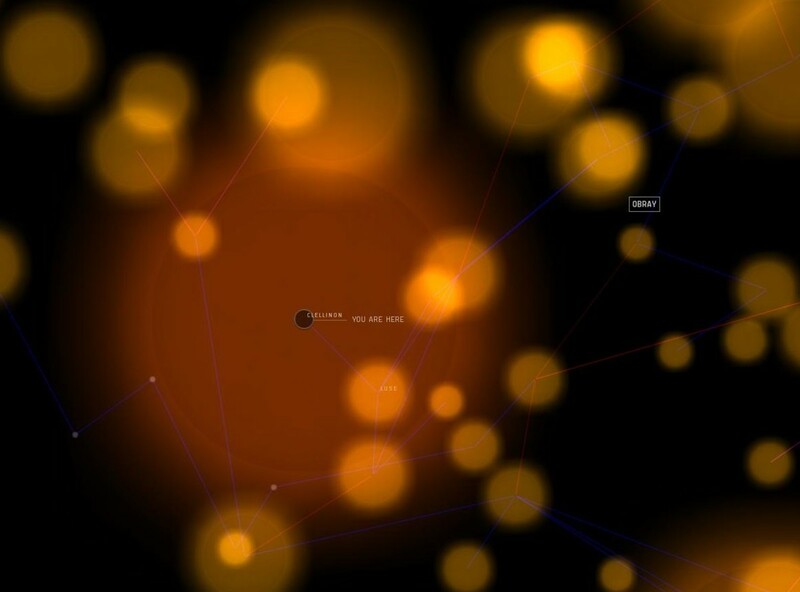 The first level allows for buy orders within the same solar system, while the max level allows for the entire region. Visibility - This skill works with the Procurement skill. While local buy orders can be set at any range, this skill is needed to have a larger range for remote buy orders. 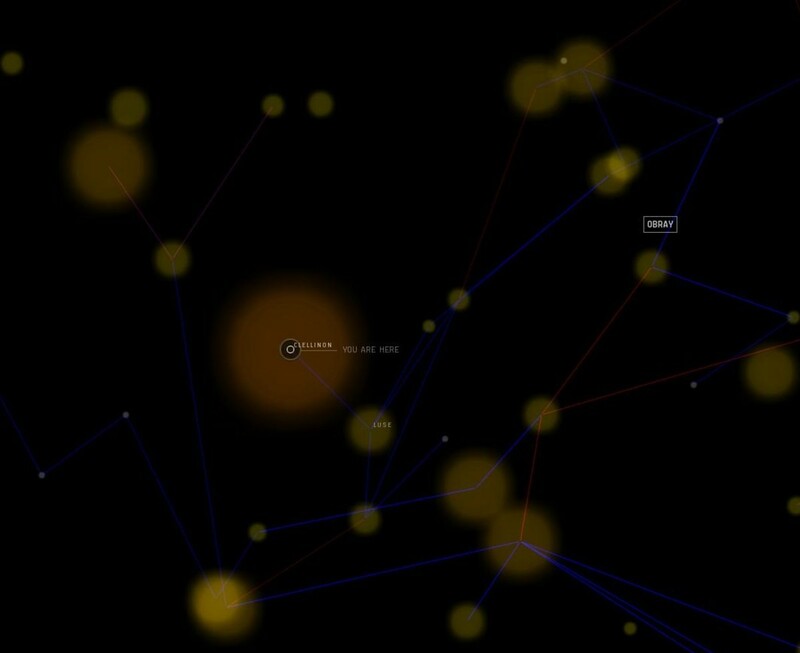 The first level of the skill allows for the solar system, while the max levels allows for the entire region. Contracting - Allows for formal contracts between players. This increases the limit of contracts by 4 per level. This is good if items need to be moved from one location to another. 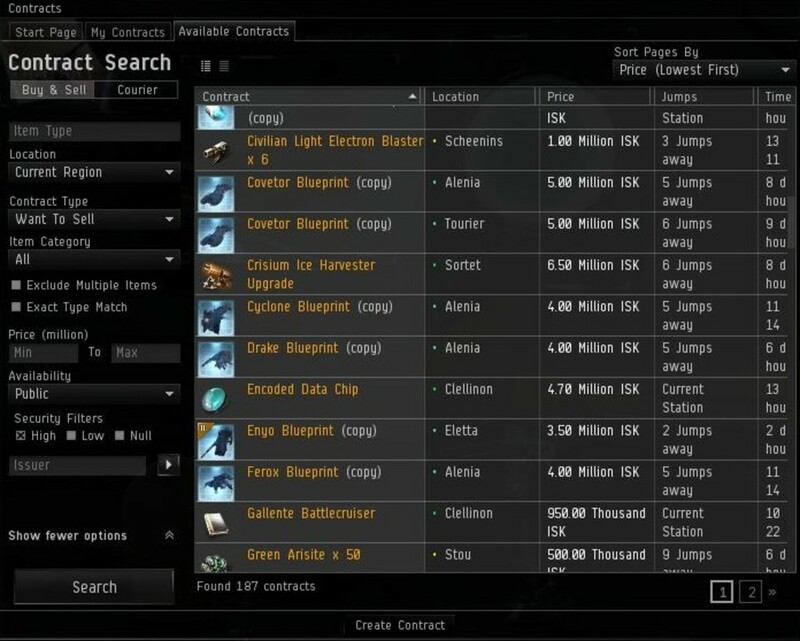 This is another way to make ISK, as some deals can be found by going through contracts, buying the items, and selling them on the market. Corporation Contracting - The skill will allow a player to place 10 contracts for their corporation, per level. Useful for those involved in a corporation. Easy to use table showing all of the trade skills, the prerequisites to obtaining these skills, and the attributes needed to train those skills faster in EVE Online. 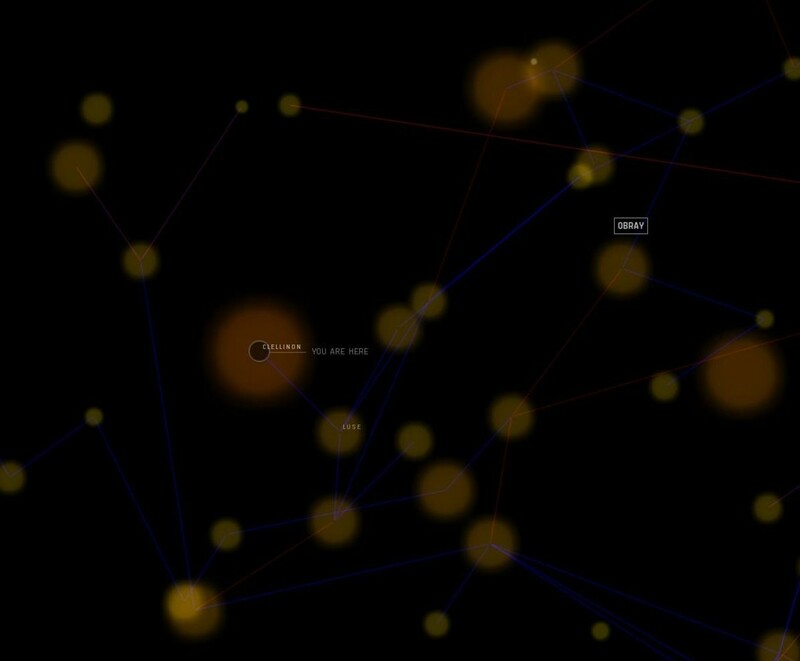 Trading Within the Region - This is the best way to trade to avoid flying around in a ship. Buying items at a low price and selling them at a much higher price. This is done by placing buy orders throughout the region for items and hoping players will sell them at the low price that was set. Setting buy orders to cover an entire region is best. Even if they are sold at stations in low sec space, there are ways to sell them or have them moved without the trader putting themselves in danger. Trading Between Regions - An item can be bought low in one region, and then moved to another region for a higher price. This requires skills in not only trading, but ships as well. Having a fast ship that can hold a lot will help increase profits. Keep in mind that more time will be spent in game this way. 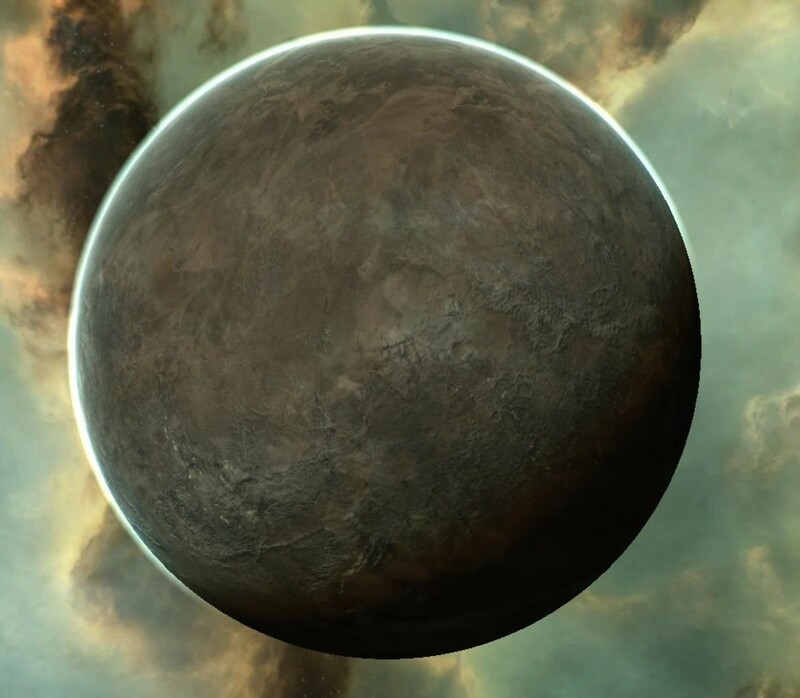 Reprocessing - Almost all of the items in EVE can be broken down to ores and minerals to be used in making other items. Depending the price of the item and the worth of the minerals, this could be profitable. Reprocessing requires more skills to be trained to obtain as many minerals as possible. Play the Market - This involves buying a lot of an item, with the expectation the price in that item will skyrocket. This can be a very dangerous move, as the market in EVE remains pretty steady and not many items get a jump in price or drastically drop in price. But if done right, it can make a lot of ISk. 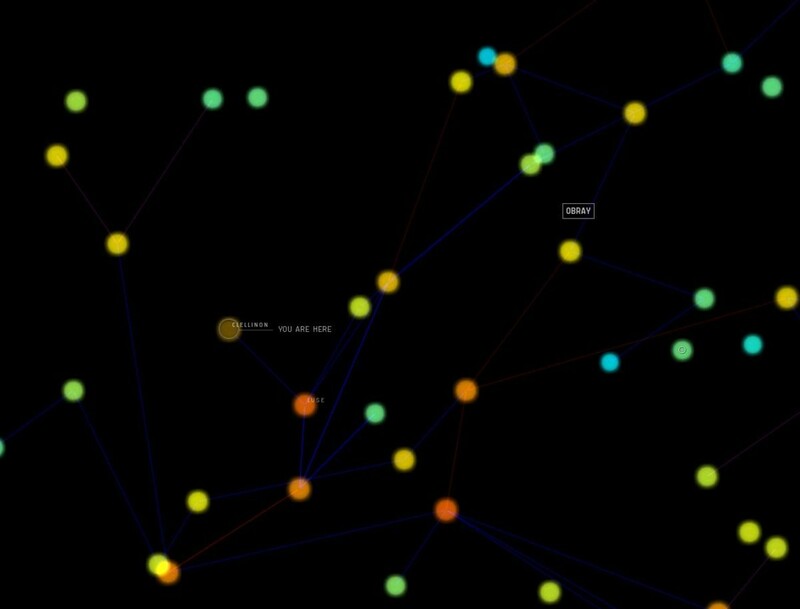 0.0 Space Trading - Perhaps the most dangerous of all of these methods is trading in 0.0 space. This involves buying items in high sec space and moving them to 0.0 space, drastically increasing the price of goods. The danger here, obviously, is getting attacked by other players and losing everything. The trill of it can be it's own reward, though. Main Window - The main window will allow searches to be done for items. Playing with the settings will allow all items to be listed, whether or not they are in the selected area. This is the best way to search for deals on the market. The main panel will describe the items, provide a price, etc. on any of the items in a given category. Don't use this when determining what to buy or sell. Check each item individually. 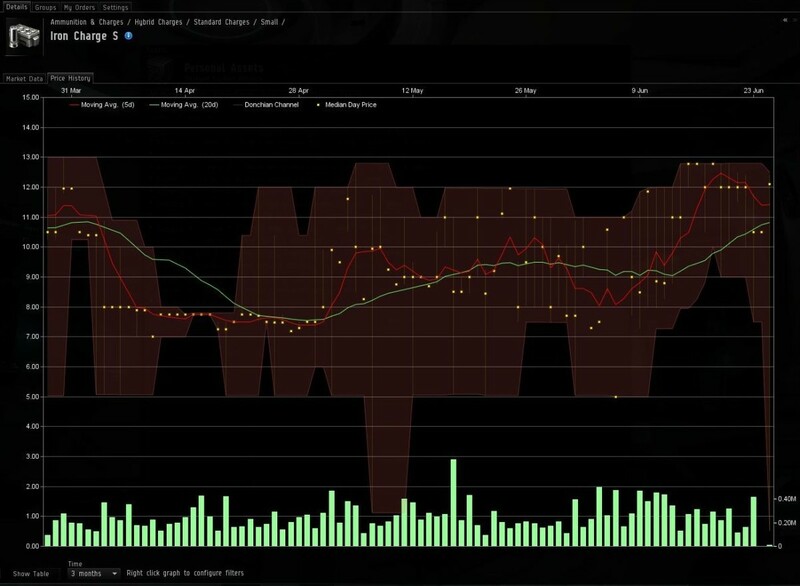 Market Data - The market data screen will show current sell orders (either by players or the station itself) and buy orders. The longest an order can be will be three months. This makes it easy to post an item and walk away. All columns can be sorted to figure out the lowest price, how many jumps the station is away, etc. Graph Price History - This graph will show very valuable information. It shows how much of the item sells over various time frames, the median price, etc. This should be used when determining if it's worth putting a buy order up for an item. Table Price History - This table provides a listing of the transactions done for the item on a daily basis, depending on the time frame selected. This should also be used when determining if it's worth putting a buy order up for an item. Quickbar - The quickbar allows items to be saved to make it easier to locate them, rather than searching for them. This makes it easy to keep track of items that are cheap to buy to turn around and make a profit on. Jumps in the Last Hour - This statistic will show how many pilots jumped to the system within the last hour. Very important in figuring out the traffic to the system, either for selling to players, or avoiding them. Average Pilots in Space in the Last 30 Minutes - Will help determine how many pilots are out flying and are active in missions, mining, etc. Helpful to determining if an area is active for buying and selling because players are active in the system. Ships Destroyed in the Last 24 Hours - Helps determine if people are losing their ships. If someone loses their ship, they will need a new ship, items for their ship, etc. This is also available for the last hour. Number of Pilots Currently Docked and Active - This will determine how many players are in stations chatting, reprocessing, trading, etc. 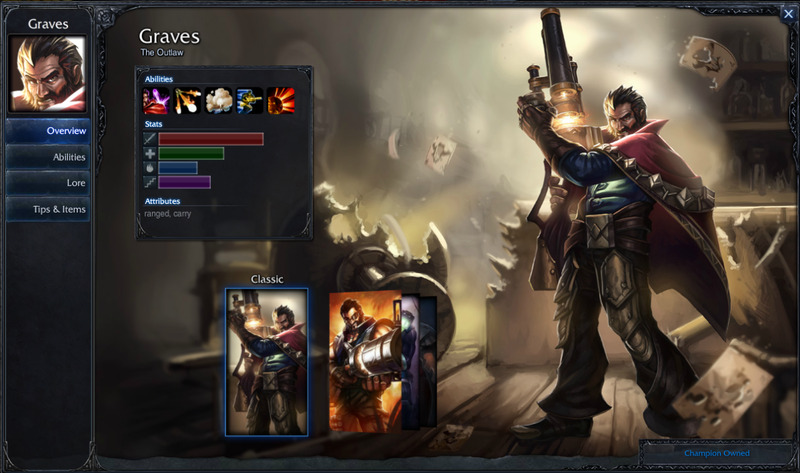 If it's a high count, then players could be actively buying and selling items on the market. Escape Pods Destroyed in the Last 24 Hours - Show how many players were pod killed within the last 24 hours, which could be helpful in selling implants and other goods. This is also available for the last hour. 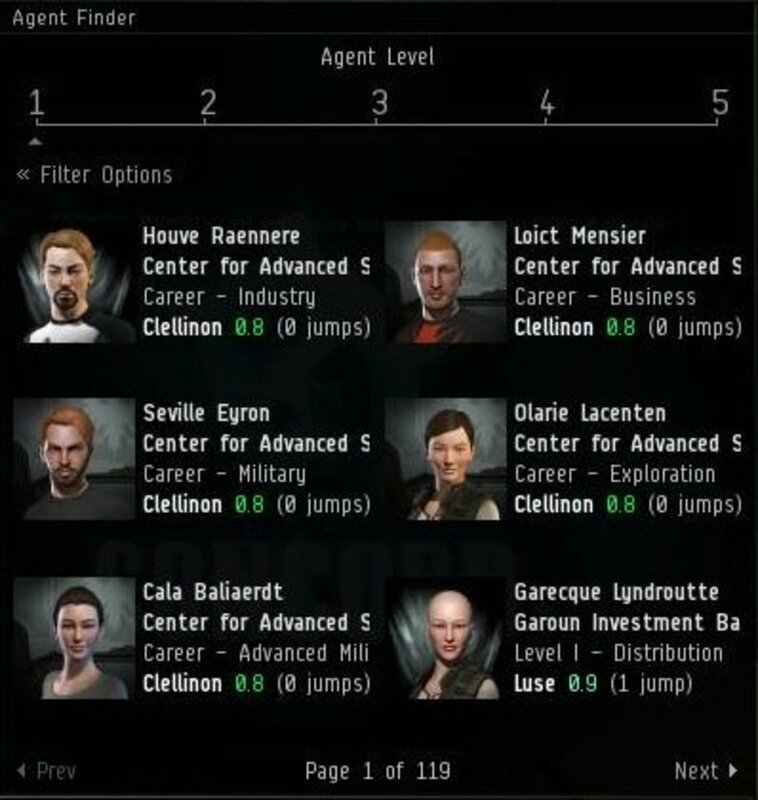 Missions - Doing the new agent missions will reward the player with skill books, ships, and ISK. This is a great way to earn money that can go towards starting a trading empire. Skills don't need to be trained in combat if a trader only sticks to the Level I missions. Mining - This is another great way to earn ISK, and can supplement a trading career. Skills are required to be a successful miner, but doesn't take too much in the beginning, especially if the new agent missions are done to help provide a ship and skills for mining. 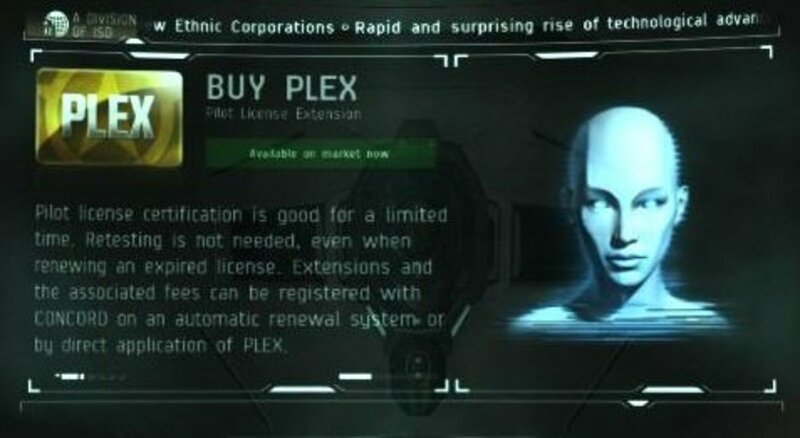 PLEX - PLEX is a way for players to spend real money on game time and sell it on the market for ISK. 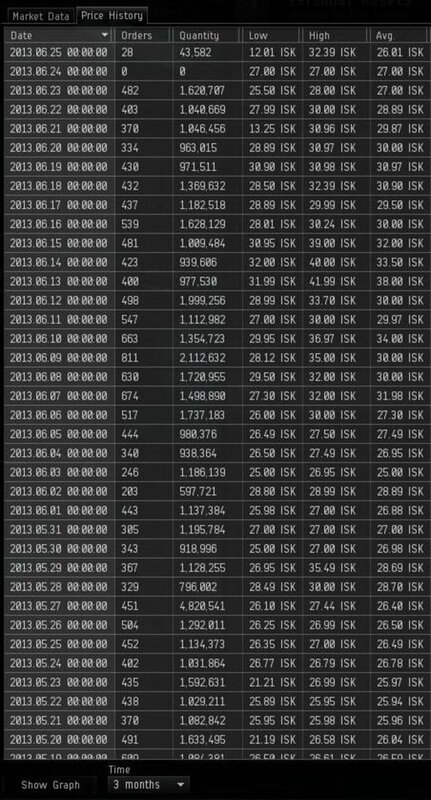 This is the fastest ways to gain ISK to avoid doing anything else but trading. After some currency is earned, it's up to the player to decide how they wish to start their trading career. 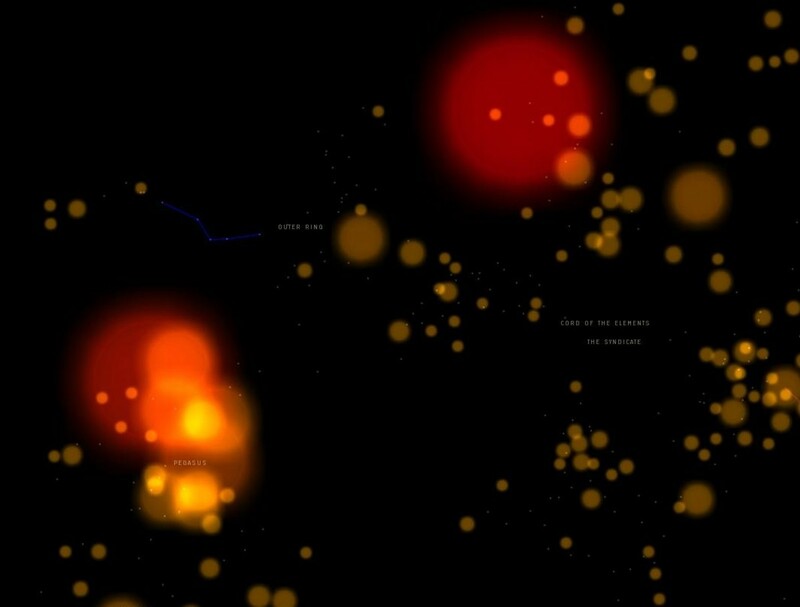 However, later in this article are some tips on how a pilot could make a lot of money in EVE, even enough to buy PLEX to pay for their monthly subscription. Ammunition & Charges - If hauling large amounts of ammo isn't a problem, then this could be a good category to focus in. This is considered a consumable good, which means players will constantly need more ammo the more they play. This would be a good thing to sell in low sec space. Apparel - Flavor items only, but it's possible to get very lucky with these as well. If fortunate enough to buy an apparel item at a low price, it can be sold at a very high price. Blueprints - This is not a great option for traders. I bypass this whenever I do my market searches. It's good only if the trader also dabbles in manufacturing as well. Drones - Just like ammo, this is a consumable item. The lesser drones are small enough so they are easy to buy in bulk and transport. However, a lot of pilots like to put up orders for these so they can replenish their supply. Still, it can be a good category to throw some buy orders into. Implants & Boosters - This is a very expansive category, with many implants and boosters to sift through. This could work better in low sec space, as those pod killed will need replacement implants. Infantry Gear - This category is for the game Dust 514. No money is to be had here, so just move on to another category. Manufacture & Research - This category is a hit and miss, and requires finding what is heavily traded and getting involved with that. This could require a large ship to haul everything around as well. Planetary Infrastructure - Used to planet construction. No profit to be found here, so skip this category. 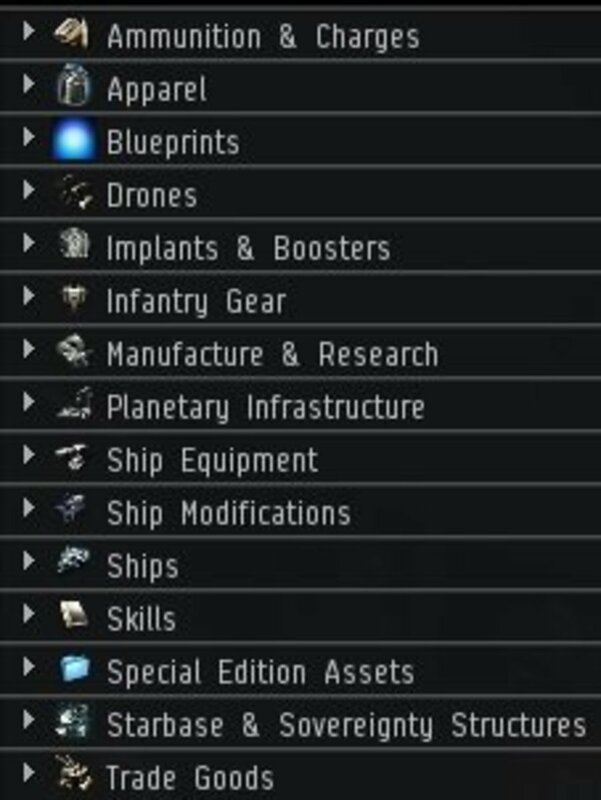 Ship Equipment - This is my second favorite category. Pilots will always need equipment when they lose their ship, move on to another ship, etc. This is where a lot of ISK can be made. It requires a larger ship to pick up all of the goods, unless contracts are made to have others haul the items or remote sell orders are made to sell the items. Ships - This is a tricky category. The only way to move the ships around is to fly them to a location. With the proper skills, they can be sold directly at the station they were purchased at. This is worth it if ships are frequently lost in a region. Skills - My favorite category. Skill books require little space, can be purchased cheaply, and can be sold for a huge profit. New players are joining EVE all of the time, so skills books are constantly purchased. This works better in areas where new players start at, and high population regions. Special Edition Assets - There are better categories than this one to choose from, so skip it. Starbase & Sovereignty Structures - Not really worth it unless in low sec space where starbases are built, and even then, there are better things to trade out there. Trade Goods - With the right hauler, this can be a very good category. It's easy to sell a lot of the goods in this category, allowing for immediate profit. 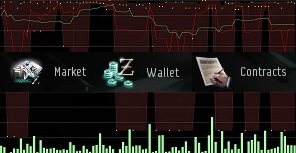 This is how I started as a trader in EVE Online. Buy Low and Sell High - This should be obvious, but there are factors to consider. When first starting out, choose items that will allow you to set a very low purchase price, like a skill book no one else has a buy order on. Once some profit is made, switch to higher cost items that will provide a higher profit. Don't Spend More Than What is Earned - As can be seen in the screenshot above, a lot of profit is being made, as well as items being purchased at a minimum value. This will always ensure a profit. Margin Trading is Dangerous - Of all of the trade skills, this is one that gets players in trouble. One time I made a purchase order using margin trading. I made a typo and added another zero to how much I was willing to pay. This resulted in me buying massive amounts of the item at a higher price. Luckily I will still able to turn a profit, but I am much more careful when dealing with margin trading. Balance Buy and Sell Orders - The buy and sell orders on the market should almost be an equal number. Then as items sell, post new buy orders. Always choose a three month duration for both types of orders. This will allow the less maintenance. If necessary, review orders weekly to see if the prices need to be modified. Pay Others to Move Items - Using contracting, other players can move items to a centralized location for easy selling. This allows a player to trade without having to pick up any goods, and requires less daily maintenance. Don't Talk - Names are posted everywhere on transactions. Don't brag in chat about ISK you are making, or about anything else for that matter. Go behind the scenes. If a trader makes themselves noticed, it could hurt when trying to sell items or travel around a region. Use All Available Tools - Graphs, statistics, etc. are all available to make it easier for traders to make a profit. Even though research can be boring, it's worth it in the long run to earn as much ISK as possible. Shoot for a Goal - Want to buy a huge ship? Or buy PLEX each month? Then shoot for a goal like that. There is no point in earning the ISK if there are no plans to use it. 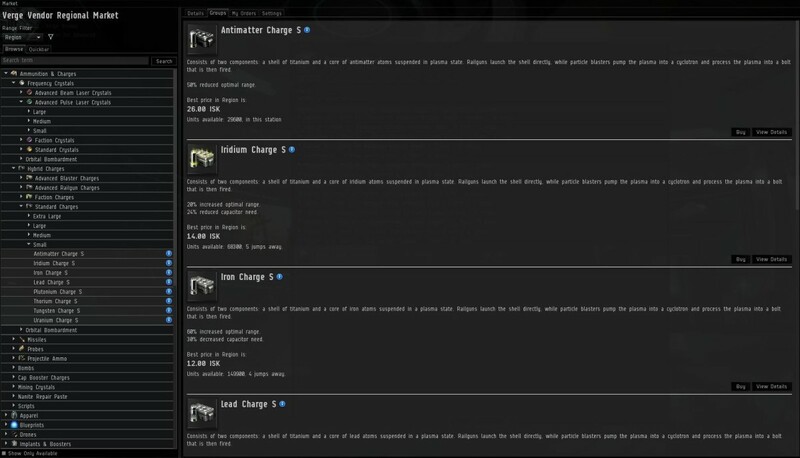 When my trader got fully up and running, I was able to earn enough ISK each month to pay for my monthly subscription. Don't Put All of Your Eggs in One Basket - Don't always go for skill books, or just weapons, etc. Spread out buy and sell orders to ensure income is coming in from various areas. If someone comes in to undercut the sell orders in one category, then a trader has other categories to fall back on. Expect to Die - This is especially true in 0.0 space. I woke up early one morning just to make a trip to low sec space to pick up some items. I saw nothing in the area so I thought I would be okay. I was wrong. I was attacked soon after I left a station. I lost my ship, the items I picked up, and my implants. It almost made me quit. But what is so good about trading is that it's not hard to pick up the pieces and move on. Industry, Refining, and Refining Efficiency - This is good when it is worth more to reprocess items rather than sell them on the market. 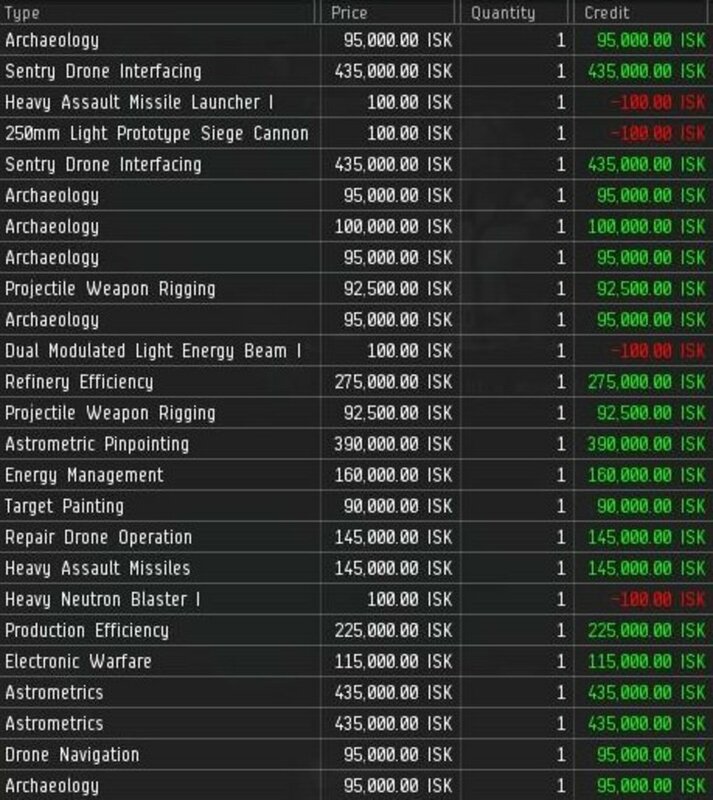 The less wasted when refining, the more ISK will be made when selling the materials. Cybernetics - Allows the use of implants, which can help further training along. This should be the first skill picked up outside of trading skills and implants should be purchased soon after. Social - Required for one of the trading skills, and can help reduce some costs of trading if trained high enough. Spaceship Command Skills - Should be trained up to allow for the use of ships that can help in hauling more and larger items. Corporation Management - Since traders may not want to interact with other players, forming a corporation with just the trader as the leader may be best. This will draw even less attention to the trader and avoid any messy wars. Planet Management Skills - Another casual way to earn ISK is to develop planets, then take the goods produced on those planets and sell them. Thanks for helping with the trade. Voted up.